The Neon Neuron Blog: By Your Powers Combined! It gets the creative juices flowing. How can something like this be incorporated into designing papercraft? How can we break the threshold of static designs into something more interactive and innovativve? How!? If you don't know what I'm referring to, look at the legs of the scorpion robot. The legs are the very basic "Valley-fold" meets "Mountain-fold". This type of fold turns a flat piece of paper into a sturdy leg structure. And, with the application of several more, you are capable of building larger and even off balanced models. This is indeed an innovation that deserves more exploration! 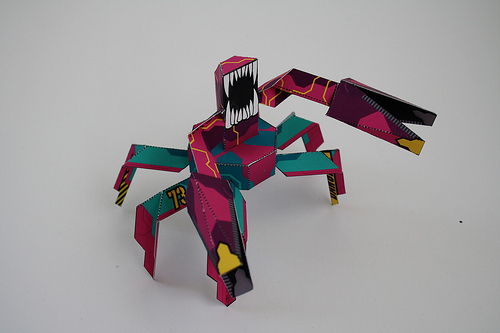 Papercraft has the potential to grow beyond game rips, 3d models and one pattern series. With a little incorporation of origami into papercraft, it evolves two worlds. So, what does the future hold for the papercraft world? I don't know...But, I am constantly looking for new ideas like the two I've explored today. Really inspiring stuff!